The Spur is a nimble, lightweight every day carry fixed blade made of tough, easy to sharpen, 1095 high carbon tool steel. The Spur is thin and sleek for easy carry yet substantial enough for a hand filling grip and versatile cutting performance. 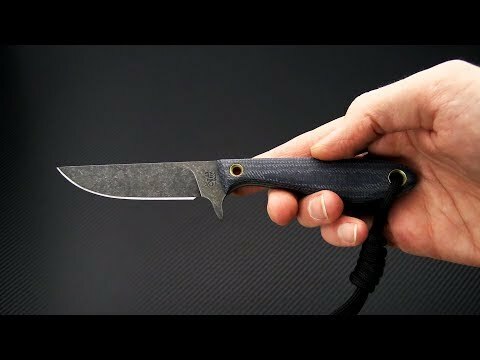 For a fixed blade the method of carry is just as important and the design of the knife. The Spur comes with a specially designed multi-carry sheath with a click-in feature which provides extra security over a traditional friction fit. The strap works for vertical and horizontal carry with no reconfiguration or can be removed and replaced with a mini Tek-Lok. For versatility and functionality the Spur is a perfect choice. Brand new directly from Smith & Sons, proudly Made in the USA. Blade: A svelte 1095 Tool Steel construction gives the Spur durability and allow for a razor sharp edge with minimal effort. The blade sports a "Darkened" acid wash and tumbled finish that contrasts nicely with the satin finished spine. The thin stock and full flat grind offer exceptional cutting performance while the narrow straight spine blade offers utility for a variety of tasks. A big 'spur' index guard provides added security during use. Handle: Tough yet comfortable Blue Denim Canvas Micarta scales from Shadetree Custom Composites are supported by the full tang construction and paired with the pommel swell handle design gives this small knife a big in hand feel. The Spur is comfortable enough for serious, extended use. Dual flared brass pins hold the scales securely and provide attachment points for lashing or lanyards, one of which is included at the pommel end which helps to draw the knife from the sheath. Sheath:The Click-in leather sheath can be used for vertical or horizontal belt carry with the included loop or the loop can be removed for attachment of other carry options.